Ukab Maerd - "The Waiting Room"
Ukab Maerd is a new side project of Djam Karet members Gayle Ellett and Chuck Oken Jr. If Ukab Maerd seems like a strange name, look at it backwards and you'll see that it's Dream Baku, a reference to the 2003 Djam Karet album A Night For Baku. Quoting from the promo sheet - "The Baku are spirits of the dream world who are devourers of evil dreams and nightmares. 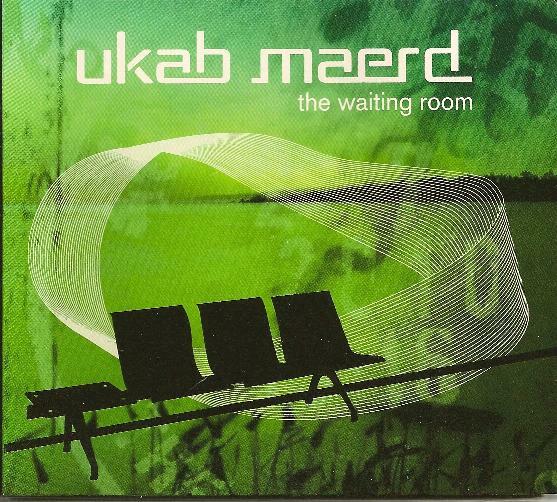 The music of Ukab Maerd represents what the Baku dream after spending elastic time in the twilight zone". Most of the music on The Waiting Room was recorded by Ellett and Oken at two live performances, and then processed guitar loops by Richard Pinhas were blended into the mix in the studio. The first of the four tracks is the 23+ minute The Cave. It starts off with pulsating waves, gurgling aquatic sounds, radio signals, light heavenly synths, and Pinhas' guitar. After a slow sound focused buildup it becomes increasingly more rhythmic and musical, creating what for me feels like a combination of ambient soundscapes and 70s Kosmiche music. The mood is peaceful though at times ominous, and if we're in a cave then you can be sure this is where the alien spacecraft is hiding out. White Light, No Heat is next and starts off like we're in a bird sanctuary that's been infiltrated by spirits. Then intense, and dense, orchestral synths come roaring in, though they quickly settle into a steady looped drone pattern that has a kind of a Fripp-Eno feel. About halfway through the piece it transitions to an electronic melodic tune that combines Krafwerk-like synths and classic 70s Kosmiche keys, all against an angelic choir backdrop. God's Elastic Acre is an intense atmospheric piece that focuses on sound creation and continual mood alteration. I experienced a range of emotions throughout this 18 minute track, at times feeling like I was under attack, and at others like I was being swept into a black hole or hurtling through a time warp. Finally, Ellett and Oken go Berlin school for the closing track, Sati & The Trainman, with its classic Klaus Schulze/Tangerine Dream keyboard sounds and synth patterns. The power of The Waiting Room is that it appeals to my love of 70s electronic music but isn't just a retro experience. Ellett and Okun draw on their influences while creatively adding their own flavor and character to the music.